Sri Lanka has faced flash floods since late May, and thanks to some brave souls, this dog will live another day. Sri Lanka has faced major flooding for over a week. 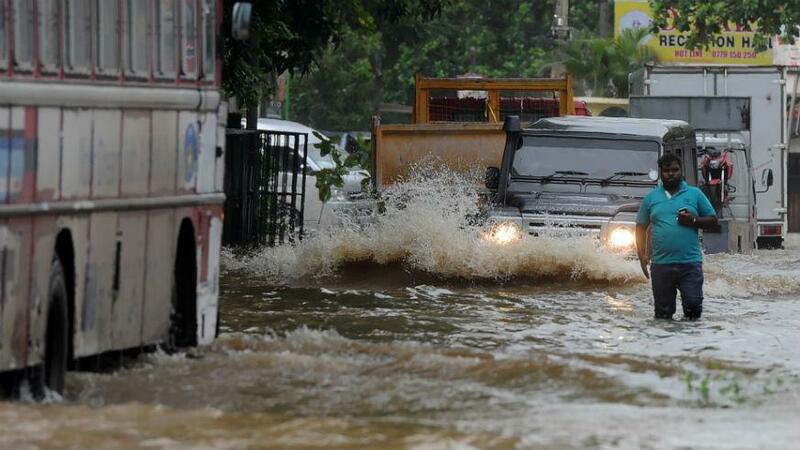 Flash floods in Sri Lanka have caused at least 23 deaths, according to the Sri Lanka Red Cross. However, through the darkness of struggle comes some light: a flash flood video has gone viral, not for its destruction, but for its promise of hope. The video, sourced from Jukin Media and posted on Animal Planet's Facebook page this afternoon, shows a community of people form a human chain to help save a dog from being swept away by flash flood waters. The video received over 140,000 views in less than four hours. "That smile at the end," a Facebook user commented on the video, "that pup is very thankful. Thanks to the heroes that saved him." "I love good news," one woman wrote (us, too). "Great job, rescuers, and thank you for sharing it Animal Planet!" What is a flash flood, exactly? We’ll break it down for you. A flash flood, put simply, is the rapid occurrence of flooding. The National Weather Service defines it as flooding that begins within six hours of heavy rainfall. "Most flash flooding is caused by slow-moving thunderstorms, thunderstorms repeatedly moving over the same area, or heavy rains from hurricanes and tropical storms," the National Weather Service states. Flash floods can also occur due to dam or levee breaks and can cause dangerous mudslides. They're the most dangerous of all floods because they happen so quickly and are unpredictable. Densely populated areas, like cities, are more at risk for flash flooding because the large number of buildings and roads leave less soil to absorb the rainwater and runoff. There are sewers and storm drains in cities to help with excess rainfall, but a large amount of water in a short time can overwhelm them, leading the water to rise up onto the streets, according to The National Severe Storms Laboratory. For information on how to donate to victims of the Sri Lanka flooding, go to slembassyusa.org or click through to the Sri Lanka Red Cross website.